Tulbagh Tourism - Spring has Sprung in the Tulbagh Valley! Spring has Sprung in the Tulbagh Valley! The days are longer and now is the time to get out and enjoy outdoor activities in our Valley and refresh your soul! Bird watching, hiking trails, mountain biking, scenic outrides on horseback, are only a few of the pleasures awaiting nature lovers. 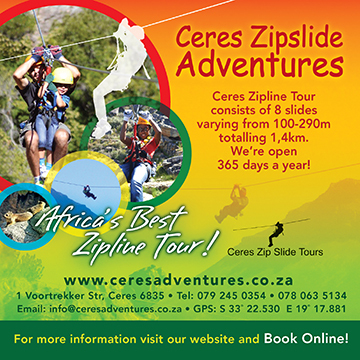 In the surrounding area you can also experience a zipslide adventure. Take a drive through the Valley - arum lilies are in full bloom and the fruit orchards can be seen against the beautiful backdrop of our majestic mountains. Tulbagh is gearing up for the Tulbagh Arts Festival 12 - 14 September 2014. Please see www.tulbaghartsfestival.co.za for the full programme. Tickets can be booked through computicket. Come and spend the weekend, relax and unwind and enjoy visual and performing art at its best!